Since I had to work (well, somebody has in this house) I couldn't participate in the Setsubun festivities. Instead, I sent the husband to the shrine downtown telling him not to come back without some snacks and lots of photos (and bento for dinner). And I’m pleased to say that he followed my directions exactly. He came back home with two bags of snacks and a few tissue packets. Not bad for a guy who was taking pictures the whole time. 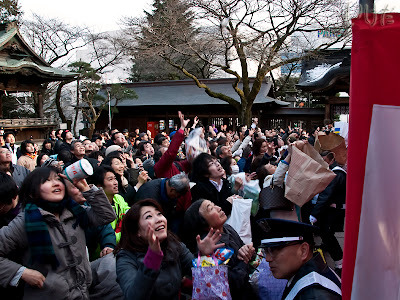 Setsubun (節分) – observed on February 3rd, is a bean (soybeans) throwing ceremony (the ritual is literally called mamemaki – bean throwing -豆撒き), which is supposed to ward off evil and bring good luck in the new year. Yeah, new year. 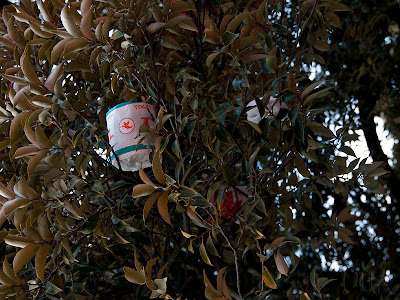 We’re talking about the lunar calendar here, of course. These days not only beans are thrown, I got pelted with rice today (yeah, some kids mistook me for the devil, it happens). Some people throw peanuts, and some – popcorn, which they say is easier for the birds to eat. 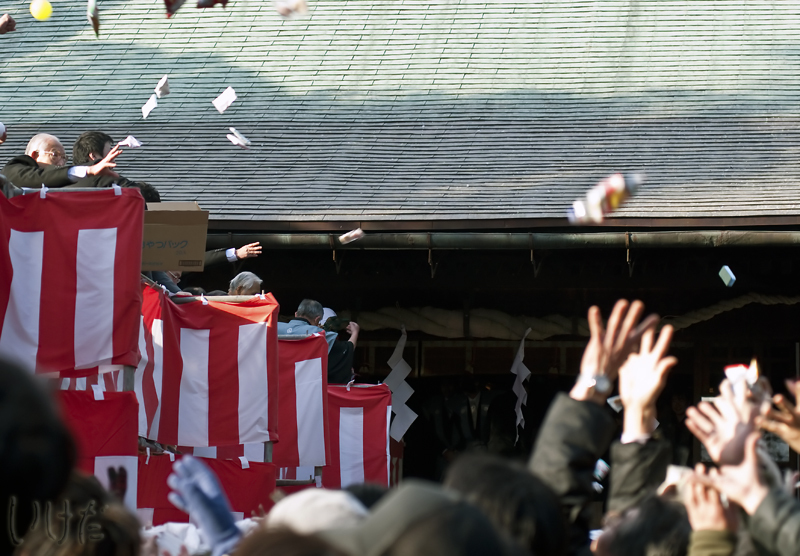 At the shrine today all sorts of things were being tossed into the crowd – candy, snacks, toilet paper and packets of tissues. It was crazy. The people behaved like a pack of hungry hyenas. 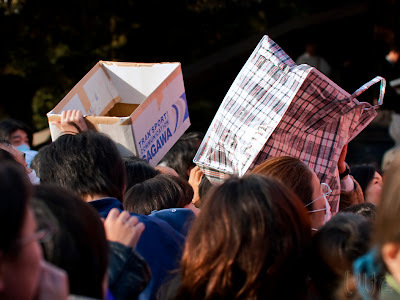 They came prepared with empty bags and boxes and there was no mercy. Getting in the way of an old lady who won’t think twice about poking your eye out for a roll of toilet paper is not something you want to experience, trust me. Unless of course, your eyesight is not your top priority. 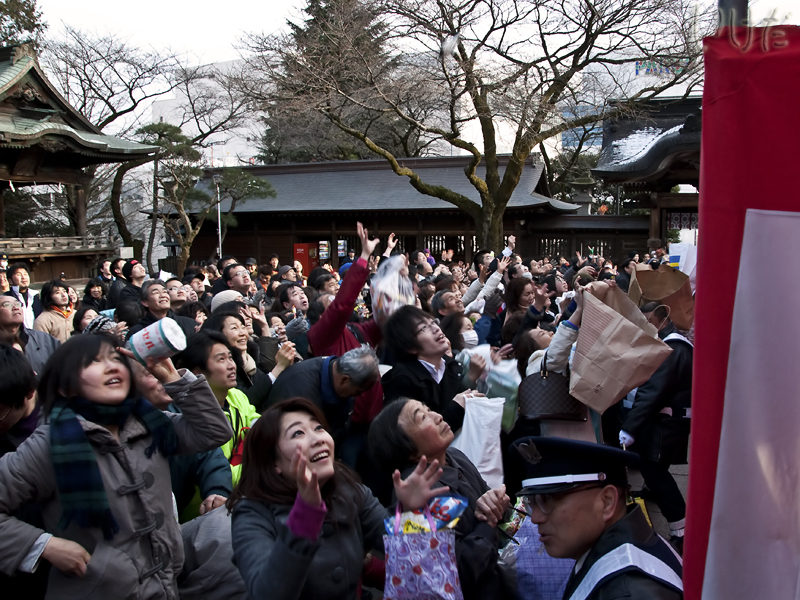 But that’s the fun of Setsubun – trampling your fellow human beings for a pack of snacks. And frankly, I'm surprised that the tree is still standing. I don't know if it's because of bad economy, but people were particularly greedy this year. 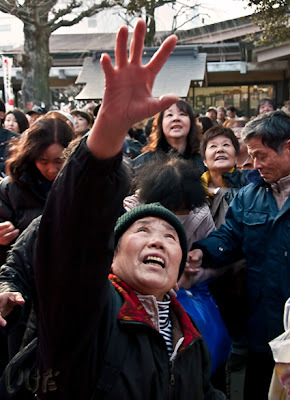 I've never seen so many people squeaking with delight at the sight of toilet paper rolls being tossed into the air. 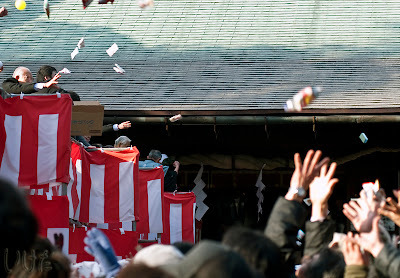 "I've never seen so many people squeaking with delight at the sight of toilet paper rolls being tossed into the air"